It’s a very special year for us at the Auckland On Water Boat Show; our 20th edition of the show. Since 1998, we’ve been helping show-goers discover the latest in innovative products and vessels and helping companies make quality connections with both customers and other members of the industry. 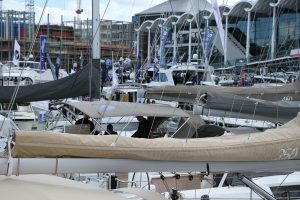 Over the years, the Auckland On Water Boat Show has evolved to become a comprehensive representation of New Zealand’s marine market. From its beginnings, the show has grown to take in the commercial sector, fishing seminars, trailer boats and a host of other vessels and accessories while retaining its status as New Zealand’s largest on-water boat show. With this edition of the show marking two decades, organisers have had the chance to look back on how it’s grown. “One of our big areas of growth has been catering to the B2B and commercial markets,” says show event manager, Stacey Cook. In its 20 years though, the show has never rested on its laurels when it comes to the factors which set it apart. Maintaining a large on-water presence, attracting high quality exhibitors, and focusing on positive outcomes for those exhibitors remain the priorities. The upper size limit of vessels displayed is steadily increasing in line with market demand and an extremely large display of RIBS at the show caters to the fishing, diving and tender market alongside trailer boats. Special additions to the 20th edition of the show will see industry growth celebrated at key events, what won’t be changing however is the essential flavour of this show which emphasises quality and innovation.